« Nature Awareness: An Cailleach Strikes Again! Blessing seeds at my altar. Photo by Grey Catsidhe, 2014. Having moved my altar into my bedroom for improved child safety and privacy, I decided my next task would be blessing seeds prior to planting. Gardening is one of my favorite activities. It’s very fulfilling and feels deeply spiritual. Growing my own herbs and what food I can is magical. I know exactly where my plant allies come from and it deepens my relationship with the Nature Spirits and the Earth Mother. I don’t have a huge garden, and what I do have is relegated to containers on my patio – but it’s a start, right? Every year, my container garden grows and improves, as does my experience! 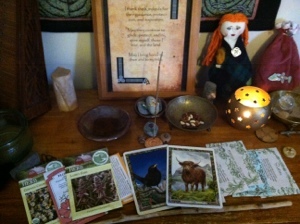 I placed the seed packets on my altar and did my usual devotional rite, but made special offerings to Airmed, a Goddess associated with herbalism. I asked her and the Kindreds to bless my seeds. Although I am growing fruits and veggies as well as herbs, Hippocrates said “Let food be thy medicine and medicine be thy food,” so it seems appropriate. My impression is that Airmed is happy to work with gardeners, and I would love to deepen my relationship with her this gardening season. Let these seeds grow healthy, beautiful, and fruitful. I drew an omen after and the blackbird and cow jumped out of my Druid Animal Oracle deck. My intuition tells me that this means I will have a bountiful year if I listen to my inner voice. I’d say that’s both a promising omen and good advice! Next I started my first round of seeds indoors. I’m doing my best to garden according to the moon. It’s a bit difficult to hit the time right and have a moment to do everything because of the baby and working during the week. According to local herbalist and magical practitioner, Sue-Ryn Burns, the first quarter is a good time to plant aboveground crops like greens, flowers, and herbs. The second quarter is a good time for starting fruits and veggies. We’re nearly to the 2nd quarter. Now seemed like the best time when considering the month, usual last frost date, and farming almanacs. It’s a good compromise all around! I love your blog. This one makes my fingers itch to begin my porch garden, but I’m recovering from pneumonia so have to wait a few weeks. This will be my first year of gardening by the moon though I’ve been gardening for 17 years. All Goddesses’ blessings on yours! Your thoughtful, heart-felt preparations point to an abundant growth. bladder, aphrodisiac Zodiac correspondences – Gemini, Taurus, Venus.